Definitely can recommend Dennis Wise’s latest documentary, “The Secret Masonic Victory of WW2”. Key questions: Who started World War 2? ….and when? Key answers: World Jewry (a.k.a. as “da Joooz”) started World War 2 in 1933 long before they were incarcerated in Germany as declared internal enemies. 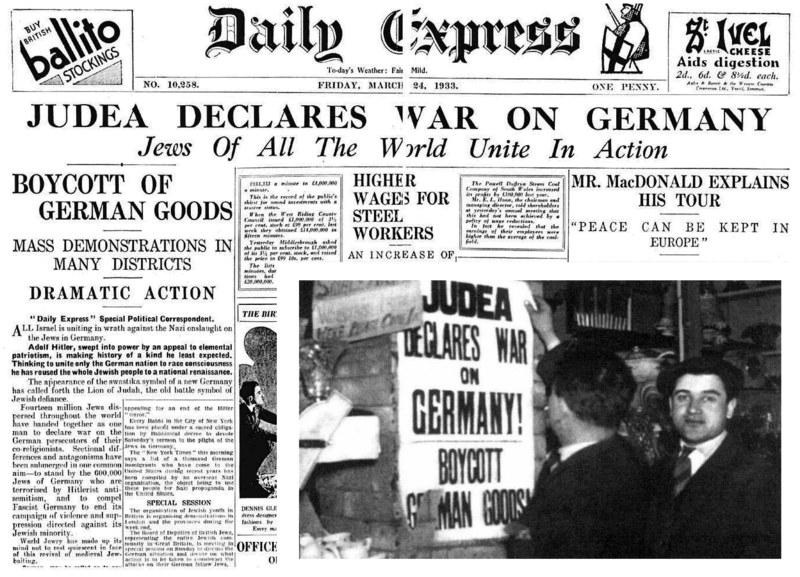 Their global economic “holy war”—Yes, they called it a “holy war”—was not just some trivial economic abstraction, but caused starvation in Germany. Surprised that some of them died in a war that they started? Typical for the Judaized Wikipedia, the entry on Untermeyer discusses his gardening, but doesn’t mention that he was the first spokesman to declare World War 2. Neither does Wikipedia mention that Untermeyer (along with Bernard Baruch) was behind the Scofield Concordance that afflicted the world with the scourge of “Christian” Zionism. I should have . mentioned that Jabotinsky was also one of the Young “Turks.” Terrorism and genocide! Tikkun olam—”Repairing the world” the Jewish way. Another good read: “Puritan’s Empire” by Charles Coulombe. Not entirely dedicated to the US’ relations with Mexico/C.America, but there are some decent sections in there which outline how the United States, almost at every opportunity, side with anti-clerical forces which ultimately destabilized the region, paving the way for the corruption we see today. This includes, in part, the Cristero War wherein true Catholic-Mexican patriots fought against the US-backed, Masonic cabal who now run Mexico. Personally if training is available it’s alway a benefit but BLOAT regardless!! Sometimes I wonder… these people with YT channels and such… that they really do like to hear the sound of their voice. And really don’t know when to just shut up. This vid is case-in-point. Is it good to get out there and practice your stuff? Yup. Can that be said without needlessly offending half your client-base? Yup. according to Zionist hillbilly, Hezbollah is “reportedly” taking over Venezuela. meanwhile, Zionist stooge Drumpf’s effort to overthrow Maduro’s neo-communist regime in Venezuela has come to nothing. this does not bode well for the upcoming ZOG attempt to destroy Iran. yourself. You owe it your family to do so. Mostly Boomerrants, but the Cdr Salamander strategic re-eval is worth reading if you are serious about attaining “Victoria” and not being a useful tool for the “conservative” globalists or the White Nat fever dreamers.